The Chota Princess II, Chota for short, lives at Aqualand Marina in Gainesville and serves as the Lake Lanier Aquatic Learning Center (LLALC), an award-winning education program started in 2000. She is the second vessel for the LLALC and was launched in the summer of 2007. Built by Corinthian Catamarans and custom-rigged by CRK’s former boat captain Harlan Trammell, the Chota measures at forty feet long and ten feet wide. She is powered by twin 225 HP Honda outboard engines and is certified to carry up to fifty-two passengers. 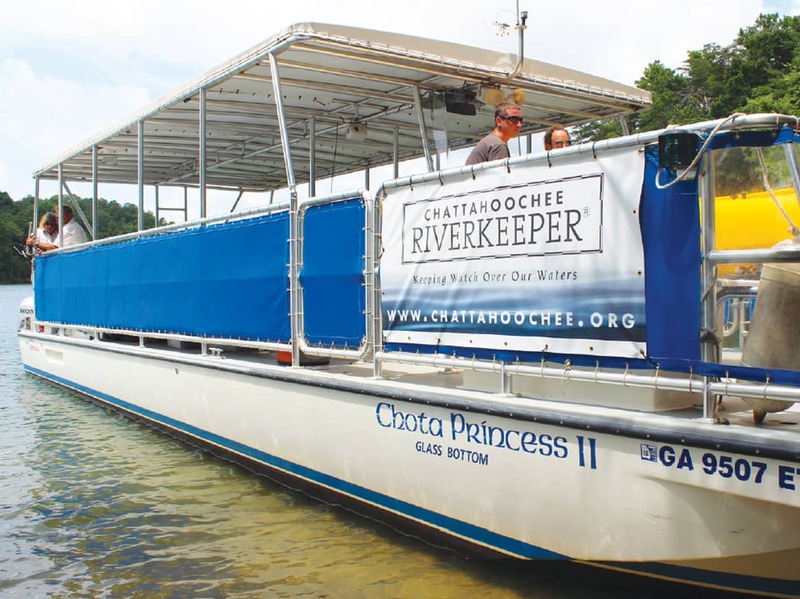 Between the months of March and November, the Chota can often be spotted on Lake Lanier near Three Sisters Islands, as she runs upwards of fifteen to twenty school trips on busy weeks. More than 5,000 students and teachers come from all across metro Atlanta to experience a truly unique hands-on learning experience each year. The Chota is also chartered for special outings and tours. Visit chattahoochee.org for 2017 outings. CRK is the only entity — governmental or non-governmental — to routinely patrol and test water quality in the river between Buford Dam and West Point Lake. 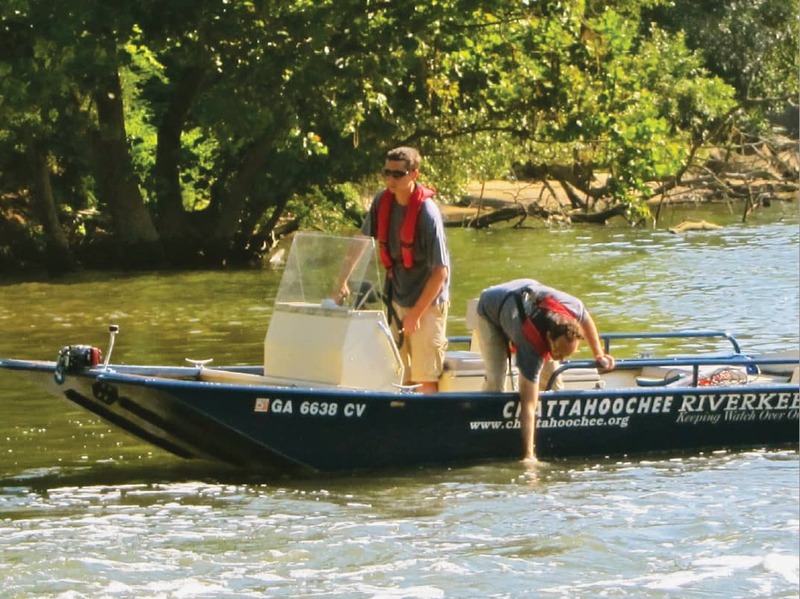 In order to navigate the rocky shoals that are present throughout this 115 mile stretch of Chattahoochee River, no ordinary boat would suffice. CRK’s patrol boat was custom-built by Oquawka Boats in Illinois and designed down to every minute detail by Harlan Trammell and Riverkeeper Jason Ulseth. Our patrol boat is powered by a 150 HP Yamaha outboard engine that was converted to a 105 HP Jet Drive. 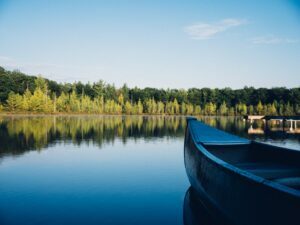 By changing the engine to a Jet Drive, the boat can run without a traditional propeller and navigate the river in as little as three inches of water. Not only can the patrol boat shoot through unbelievably shallow water, she is built as tough as a tank. The entire outer hull is constructed with one quarter inch thick aluminum, which is literally bulletproof. This means that if the boat does bump or rub a rock in the shoals, no damage is sustained. Following the tremendous success of the Lake Lanier floating classroom program on board the Chota Princess II, we began the process of building a second floating classroom boat for West Point Lake in 2014. 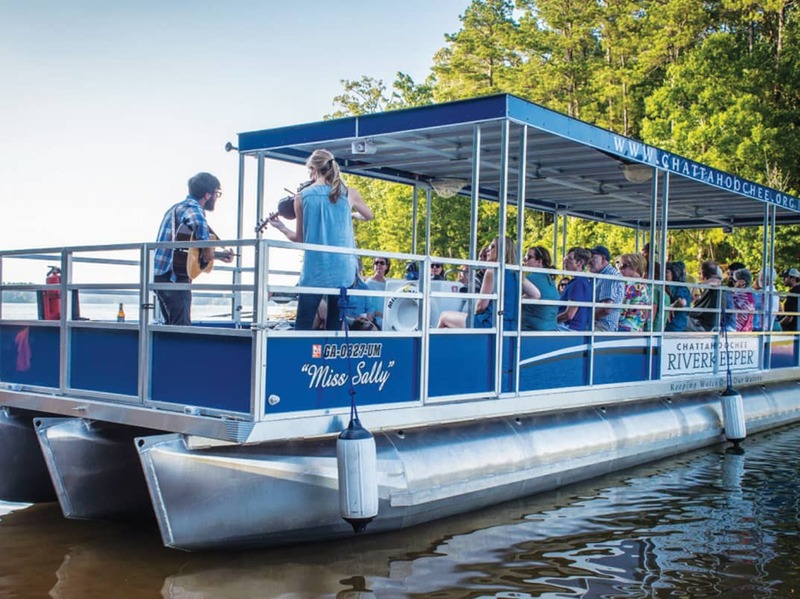 After a nine-month long construction period by The American Pontoon Company, the Miss Sally was launched on West Point Lake in July 2015.
addition to wildlife, history and music programs for all ages.